$5 from your purchase of this playful piece supports Understood.org. Mini marshmallows, oyster crackers, fruity cereal. Why do they make kids' food so fun if they're not allowed to play with it? At age 8, kid-preneur Max decided to change all that. 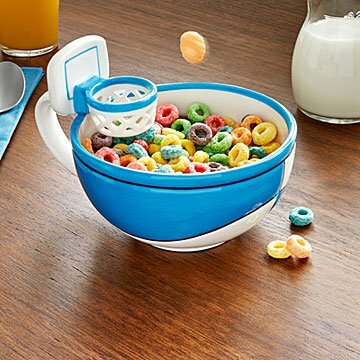 He designed this playful mug to make meal time a slam dunk. But the piece is more than just a fun way to snack. $5 from your purchase supports Understood.org, an online resource for parents of children with learning disabilities, to help families get the knowledge and support they need. It makes a thoughtful gift for children with special learning needs, kids who love sports, or any little one who loves play time (all of them, right?). Made in Thailand. Breakfast cereal and hot cocoa with marshmallows. The boys had fun shooting baskets at their hot chocolate. This is a unique and fun gift. Plus a portion of the purchase went to charity. Great gift for basketball enthusiast. Added a gift certificate inside too and it was perfect. Great breakfast bowl for Chirios and other morning treasures. Fantastic for the basketball fan! My daughter is a basketball player and I think she'll get a hoot out of this! It's really adorable.